Need a way to carry an extra ball with your roller? Look no further than the Storm 1 Ball Spare Kit. Designed to hold one bowling ball and connects easily to the handle of your roller bag. Turn your favorite 2 ball roller into a 3 ball roller! Dimensions: W 9" x D 9" x H 11"
If you need an extra bag for your spare ball to go on top any telescoping 3 ball carrier. This is a great choice the Velcro strap secures perfectly to the handle and the extra pocket is great. This bag is the perfect size for those of you looking to add a one ball capacity to your current rolling 2 or 3 ball bag. The straps on the back allow you to secure it to the handle on your existing bag. The small front pocket gives you a little extra storage space for a small towel, rosin, or slide. A great add-on! I bought one of these for me and one for my wife and they are perfect for piggy backing a spare ball or any extra ball onto a 2 or 3 ball roller bag. Having the accessory pouch is a nice bonus - never can have too much space for your extra "stuff"
I love this spare ball carrier it goes on top of my roller bag and is a great tool to have when you need that extra ball. I love the Velcro closure that attaches to the carrier. This is a best buy for the money and the delivery was exceptional. 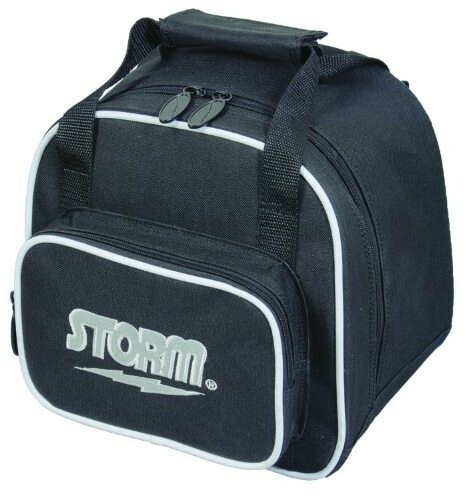 I was wondering if this Storm spare kit would fit on the Storm Lime and Green 4 ball roller? Hello! Yes, this spare kit should work on Storm 4 ball rollers as well. Hi Willie. Yes it will have a strap that will fit over a handle. It can work for any roller. Due to the time it takes to produce the Storm 1 Ball Spare Kit ball it will ship in immediately. We cannot ship this ball outside the United States.